The Fifth Sunday in Lent (April 2nd, 2017) – Rev. Canon Dr. William J. Danaher Jr. The Rev. Canon Dr. J. William J. Danaher, Jr. When I was first ordained I was spending a lot of time introducing myself to people and telling them a little bit about myself. It was a way to kind of find my way in the church. I’d have to fill out different applications for different things. I had to learn to compress my narrative into basically two or three sentences. One of the things that I came up with was that I would say that I never had – I had neither the benefit nor the liability of a religious upbringing. By that I meant both things. The benefit of a religious upbringing is a wonderful thing. It’s an incredible thing and one of the reasons why we invest so much in our Sunday school and in our Vacation Bible School and all the programs we have for our youth is because we believe that having a place for children to know and love God from the earliest of days onward is an incredible mission of our church, but I didn’t have that benefit you see. I did not have an organized Sunday school. My parents were not regular church goers. I did not have the benefit of all those songs and all those deeply formative experiences. For me, Jesus Christ was a person I came to believe in when I was 16 years old. I’ve come to see that as a true gift, but I realize that I did not have the benefit of a religious upbringing but I also didn’t have the liability of a religious upbringing. By that I mean I know so many people who have been Sunday school Christians, who have been raised in a faith. They get to be a certain age and none of it seems to hold together. Whether they become disillusioned because of the behavior of somebody in their church or they come to see the lessons they learned as somehow less than the challenges they face. For one reason or another, there are people who experience their religious upbringing as a liability. When I think about these things, I find myself in a powerful place because I realize that not having the benefit nor the liability of a religious upbringing, it taught me something really powerful about God. Because basically, for me, Christianity is not a vehicle for socialization. Christianity for me is not a way of teaching me how to be in the world or how to behave. Christianity for me is actually a message of liberation and transformation. And as important as it is for us to have this religious education that we have for our children, I think that Christianity fits better as a message of transformation. As a message of liberation. As a message of new birth. That is the story that I tell as a priest and as a Christian. Because when I was 16 years old, I came to believe in God. That moment of conversion, that moment of new birth, came when I was in the midst of a kind of depression. I was at a school and I wasn’t fitting in and I was falling through the cracks, and wonder of wonders, the school thought that they could help me by sending me to see a psychiatrist. They were right to intervene. I was in the midst of a pretty deep depression. I was experiencing what a psychologist would call suicidal ideations. I was imagining what the world would be like without me. Every week I would get into this van provided by the school and they’d drive me off to this little colonial house. In the upstairs of that house was Dr. Mirabile. That really was his name. He had these two seats in his little office. He had this beautiful professional seat and that was Dr. Mirabile’s seat. Then there was this seat which all of his patients had sat in and the seat was completely tattered and it had been torn apart by everybody else who had been sitting in it. Like the leather was pulled up and it was scratched. It looked like people had been gnawing on it. I knew instinctively when I walked in which seat I had to sit in. I sat in the seat that was damaged. That was meant, I think, to communicate to me the fact that I was a little damaged too. Dr. Mirabile and I spent several sessions staring at each other. Because I was 16 years old and self-reflection when you’re 16 years old is a thing of – it’s a miraculous thing. You can’t expect that of a 16 year old, to be self-reflective really. I knew that he somehow wanted to convey a place of safety so he had this kind of gentle smile, but I experienced it as judgment. The sessions really didn’t do much for me. I don’t remember one word that we exchanged. Something else happened to me that year that changed my life completely. For reasons that I still find a bit mysterious, I decided to try to pray. Because I had heard that God cared for me. In the moment I prayed one night when I was 16, I suddenly experienced the presence of a loving God. In my room, enveloping me. Being part of my life, lifting me up. That presence and that relationship made all the difference in my life. I suddenly was able to know myself as beloved by God. That transformation and that liberation, that new birth, began to show forth in all of my life. I began to see all that I was as a gift and I began to suddenly experience some of the successes that people measure other people by in this world. Six months later I went back to see Dr. Mirabile. I told him what had happened to me. He looked a little concerned. He had a knowing smile and he said, “It’s wonderful. It’s nice how some people find faith.” I remember being so frustrated by that answer because I felt so sure that I had come into contact with the power and love that lay at the center of the universe. When I read the pages of the scripture, I met the person behind that power and presence in Jesus Christ. I believe time has vindicated my experience. My life is completely turned inside out from that day forward. Of course there have been peaks and valleys, hard moments and turns, but God in my life has been the greatest experience of resurrection I can point to. I feel that resurrection not only in all the wonderful gifts that my relationship with God has enabled me to experience. My incredible opportunity to be the husband of Claire Danaher and the father of Phoebe and Thea, and the Rector of Christ Church Cranbrook. All of these incredible gifts. They’re wonderful, but the moment that I have felt the claim of the resurrection of God in my life, is when I get the opportunity to sit with someone else who’s in their teens who have been struggling with depression. To simply share with them a little bit of my strength and experience and joy and hope. Earlier this year I had the opportunity to sit with a member of this congregation who had fallen into depression, and she was in a place where she was getting some steady care. I asked if I could visit her and I went to see her. They put us in a room in which there was a desk and a chair behind the desk. A chair in front of the desk. I remembered the politics of the seating at Dr. Mirabile’s office. I wanted her to feel empowered, so I said to her, “Why don’t you sit behind the desk and I’ll sit in front of you.” She sat down and I said, “Of all the blessings that I experienced by surviving depression, I never could imagine sitting before you this day. And how grateful I am that I have the opportunity to sit before you and share with you a little bit of my experience, strength and hope.” The greatest blessing for me has been that when she left the place where she was staying, she placed me on her list of safe people to call. Now I’ve shared all of this with you because I think this is a way for us to get into this incredibly powerful message in today’s gospel from John. Because, you see, there is a moment in here in which we are led to the belief that Christianity is not about a set of concepts, but a reality that we inhabit and a power we receive when we experience a living relationship with Jesus Christ. That you see a little bit in the exchange between Jesus and Martha and Jesus and Mary. Martha is speaking of a doctrine. She’s speaking of a belief. A theory of what happens to us when we die. Certainly the resurrection has been treated in that way. The reality of the resurrection is not as a theory or myth of what happens to you when you die. The resurrection becomes real, when real things happen to us and we receive the power of transformation and liberation in Jesus Christ. When we receive the power to live as if death were not. When we are not defeated by the things that oppress us. By the sins that weigh us down. By the things that hold us in one place. The resurrection becomes real when Lazarus comes out of that grave. That physical resurrection is meant to convey to us the spiritual reality that you and I experience everyday when Christ comes and meets us and when we have a relationship with Jesus. That is what it means to believe in the resurrection. That is what it means to hold on to the resurrection as the bulwark and the basis of our Christian faith. There are two other things that I want you to see in this passage because I think it is so key. As long as it is, I want you to take it home and read it this week. The two things that I want you to see, the first is to recognize two moments in the passage that you are meant to take home. The first is that the end of the passage begins when Lazarus comes out in his grave cloth, struggling with life. Of course, that’s just a way to finish the story in some ways, right? A person who has been left for dead, has been bound up which is the traditional practice that they did when they would bury a body. They would be wrapped in a shroud and everything would be put around them to keep them tight. Of course, this scripture was written for a living community and not simply to tell a story. You and I need to ask ourselves as we are moving towards Easter and to the celebration of Jesus’ resurrection: What kind of grave cloths am I currently allowing myself to wear? What do I need to take off so that I can experience the transformation and liberation of Jesus Christ? In what ways can I be made new by this experience of Christ living in me? The second little piece, a fold of the story, is the moment in which we read that Jesus wept. This is the confirmation of the fact that the resurrection is a real event and not merely a conceptual belief. Because Jesus, even though he knows that he is on his way to raise Lazarus – even though he knows, he still so much is entered into human experience that when he sees Mary weeping and the people with her weeping, he himself is moved to tears. This teaches us something really key about the resurrection. You see, the resurrection is not the denial of death. It’s not an escape myth. The resurrection actually takes the summation of human experience and transforms it into good news and to the victory of Christ over the powers of everything that oppose him. You could almost take any other message of Jesus away from me, but give me the one of Jesus weeping and that will be enough. Because on the basis of that relationality, the resurrection stands. The second thing I want you to keep in mind as we go through the celebration of Good Friday and Easter Day, and all of Holy Week, I want you to keep in mind that cross and resurrection are intimately connected. You cannot have the cross of Christ and have it be good news to you unless you know that deep within the cross of Christ is the promise of life and victory, and the victory of Jesus Christ over the grave and death. That the resurrection is knit within the cross of Christ. It becomes good news to us to the extent that we see it as the path to liberation and transformation. You see that even in this incredibly powerful story of resurrection because you see at the beginning of the passage, when the disciples are dissuading Jesus from going to Jerusalem, they’re trying to dissuade him from going to his death. Jesus to save his friend Lazarus, goes and gives himself so that his friend may live. Jesus is on his way to death and even in the midst of moving to death, he raises up Lazarus to life. The resurrection begins today, you see. Jesus gives himself for his friend’s greater love than this. There is no other than a person would give himself for his friends. Jesus says that in the midst of him moving to Jerusalem in the gospel of John and there it is in today’s gospel reading for us. 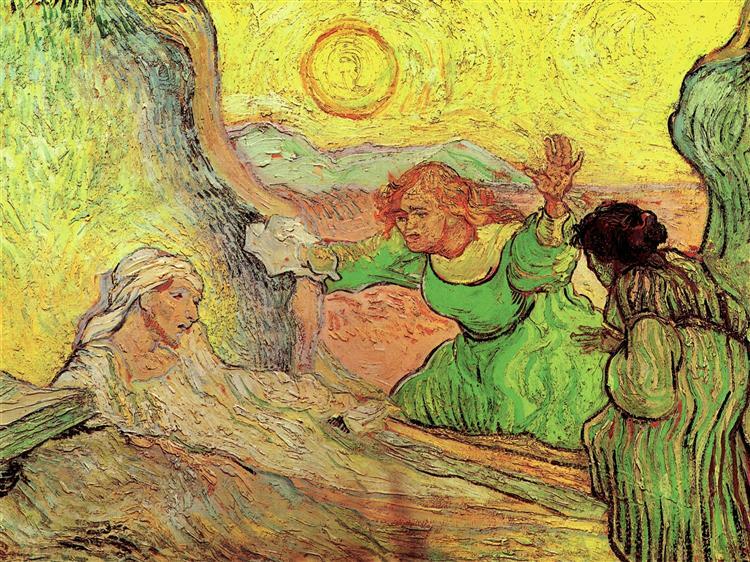 The art for today is from Van Gogh’s The Raising of Lazarus. Many people don’t know this about Vincent Van Gogh – being an artist was his second career. His first career was as a missionary to minors in Belgium. He failed at that. The minors I think found him too intense. Painting became his second career. Van Gogh, throughout his life, had a powerful spirituality. This painting towards the last year of his life, The Raising of Lazarus, you see Van Gogh at the height of his powers in which the things that he saw in terms of color, and that color could be just as important in a painting as perspective or proportion. You see that all played out in this incredible moment of emotion when Lazarus comes to life and you see Lazarus lying there. The key to it, in my opinion, or the way that I think I see it today, is the fact that this Lazarus is wearing a red beard. Just like Vincent Van Gogh. You see Van Gogh sees himself as Lazarus coming to life in the midst of all of his struggles. In the midst of everything that he is experienced, the fact that no one is buying his paintings. He is painting to the glory of God and trusting in the resurrection. Are you?